What Is DA Form 7222? Special, obtained when the Ratee is temporarily promoted, detailed, or assigned away from their normal duties in any other way. The latest edition of the form - sometimes incorrectly referred to as the DD Form 7222 - was released by the Department of the Army (DA) in March 2010 with all previous editions being obsolete. An up-to-date DA Form 7222 fillable version is available for digital filing and download below or can be found through the Army Publishing Directorate website. The DA Form 7222 is usually distributed with the related DA Form 7222-1, Senior System Civilian Evaluation Report Support Form, used to record performance plans for the Ratees in the Senior System. 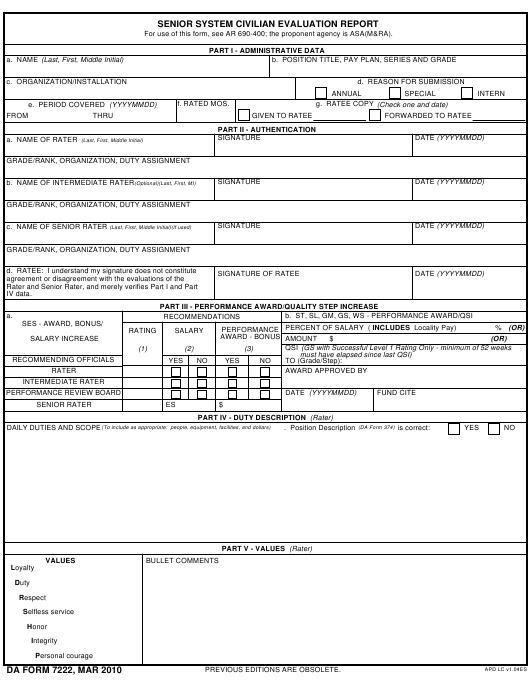 How To Fill Out Da Form 7222? For use of this form, see AR 690-400; the proponent agency is ASA(M&RA). Part I requires administrative identifying data about the Ratee. This includes their full name, the information on their position, the name of the organization or installation and their MOS. The first part of the form is also used specifying the purpose of the report, marking it as an annual, special or intern appraisal. Part II is for identifying the rating chain. Each Rater has to provide the following information: their full name; their grade or rank; the organization and duty assignment prior to signing and dating the form. The rated person also signs the second part of the form. Nominations and approvals of performance-based rewards and QSIs should be indicated in Part III. Parts IV and V are intended for duty descriptions and bullet comments respectively. Part VI requires specifying whether the DA Form 374 of the Ratee is correct. The second page of the form should contain the Ratee's name and the covered period in the top line of the form. A performance evaluation and a performance rating should be provided in Part VI. Part VII is filled in by the Intermediate Rater if they took part in the rating chain. Part VIII is for the overall evaluation of performance. An unsuccessful rating must be accompanied by a review made by a Senior Rater. Part IX is reserved for any comments the Senior Rater may have. This part should indicate whether the supporting DA 7222-1 Form was attached and taken into consideration. A negative answer must be explained. The document must be signed by the rating chain and the Ratee to be valid. The completed annual appraisals are prepared in three copies. The original form is kept by the Ratee, one copy should be submitted to the Civilian Personnel Office, and the second copy is kept by the Rater. In case any mistakes are found on the DA 7222, a new document should be prepared and signed by the appropriate Raters. All of the official copies containing the error should be destroyed.